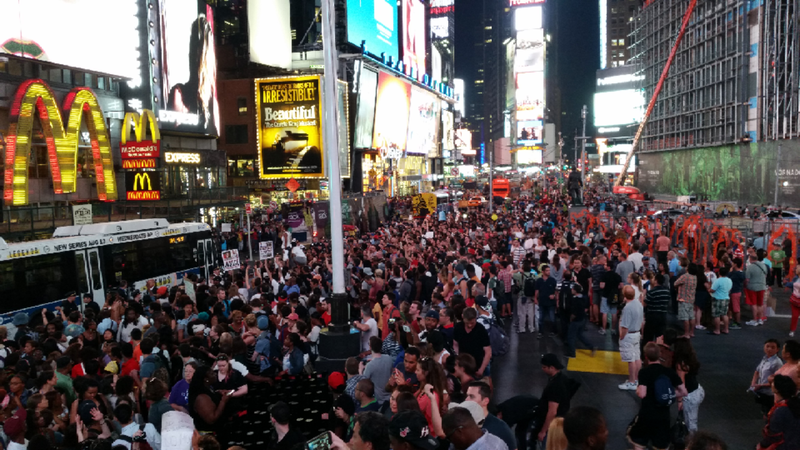 Thousands gather in NYC voice their opposition to police tactics in Ferguson. Thousands of people gathered on New York’s Staten Island on Saturday as they protested against police violence and called for justice in the case of an unarmed man killed by an officer via an illegal chokehold. Organized by Rev. 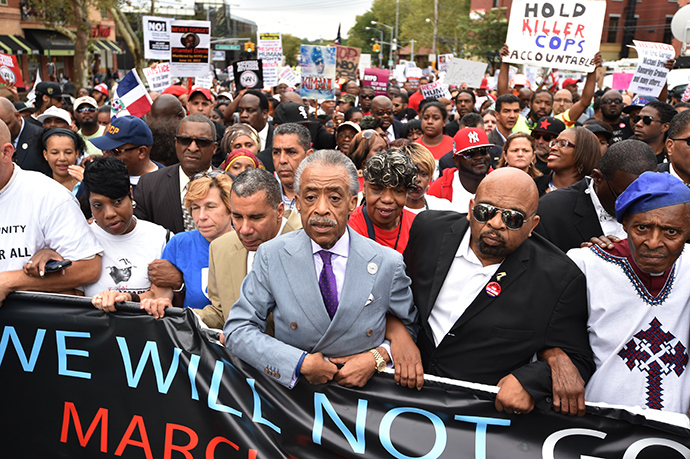 Al Sharpton’s National Action Network advocacy group, the #WeWillNotGoBack march attracted close to 3,000 people from across New York City and New Jersey, according to initial estimates by the police. The event specifically highlighted the death of Staten Island resident Eric Garner, who was killed in July after a New York Police Department officer placed him in a chokehold for allegedly selling loose, untaxed cigarettes. With the additional help of other law enforcement officials, the 43-year-old father of six was taken to the ground, where he repeatedly complained that he could not breathe. However, video of the incident shows that police did not seem to respond to his objections. The city’s medical examiner ruled Garner died as a result of the chokehold – a move which is banned by the NYPD – and declared his death a homicide. The officer who performed the chokehold has yet to be charged with a crime, and that has triggered harsh criticism from African Americans and others in the community who say police continue to apply excessive and deadly force against black, unarmed men. Some protesters told RT that regardless of who was occupying the mayor’s office – current leader Bill de Blasio was an outspoken critic of the NYPD before being elected last year – African Americans would have to continue to fight against wrongful police behavior themselves. In addition to Garner’s death, protesters and speakers honored the lives of others who have been killed by law enforcement, including Michael Brown in Ferguson, Missouri. Addressing the crowd, Sharpton emphasized the non-violent nature of the protest, rebuking those who would use force to accomplish their goals. He also dismissed claims that the rally was anti-police. While most officers do their jobs correctly, he said, there must be accountability when crimes are committed. Bishop Victor Brown of the local Mount Sinai United Christian Church also spoke, energizing the crowd by proclaiming the protests would not cease until law enforcement agencies stopped debasing the lives of African Americans. Garner’s family was present onstage, as were other mothers and grandmothers of young men who had been killed by police, and they thanked those in attendance for participating. House Rep. Jose Serrano (D-NY) and former Gov. David Paterson also spoke briefly and in favor of reform. Meanwhile, police presence at the rally was strong – at least four helicopters could be seen hovering overhead – but the event was marked by peaceful demonstrations and cooperation between law enforcement and citizens. The NYPD reacted quickly and administered medical attention when an older woman seemed to lose consciousness in the crowd. Before concluding the protest, Sharpton said another rally would be organized in Washington, DC, when Congress is back in session.